The Wormskin fanzine, published by Necrotic Gnome Productions is written for use with Labyrinth Lord and issue by issue, details an area known as Dolmenwood, a mythical wood, an ancient place of tall trees and thick soil, rich in fungi and festooned with moss and brambles and rife with dark whimsey. Published in December, 2015, Wormskin No. 1 introduced the setting with a set of articles rich in flavour and atmopshere, but lacking a certain focus in that the region itself, Dolmenwood, was not detailed. Wormskin No. 2 suffers from a similar problem, but fortunately, in March, 2016, Necrotic Gnome Productions released Welcome to Dolmenwood, a free introduction to the setting. That said, Wormskin No. 2 loses none of the dark tone and whimsey of the first issue. Wormskin No. 2 opens with ‘Common Tavern Fare’, a quick means of providing flavoursome provender at a hostelry, whether that is spit-roast pork shank with vinegared oak leaves or a giant puffball mushroom sandwich with parsnips and burdock. The contents are intended to be just that little bit different and thus make any tavern that serves such dishes memorable. This is followed by ‘Psychedelic Compounds’, which treats psychoactive powders, infusions, and fumes in exactly the same fashion as fungi was in ‘Fungi of Dolmenwood’ in Wormskin No. 1. A table lists some thirty compounds, their slang names, substances, procedures for use, and both primary and side-effects, whilst the article details they are manufactured and sold. For example, Angel Dust is ground Unicorn horn which is moistened with wine to make the user feel great, even godlike, though the eyes take on an unnatural hue. As good as this article is, it feels too much like a retread of the ‘Fungi of Dolmenwood’ article from Wormskin No. 1. If the article had appeared in a later issue of the fanzine, then the comparison would not be as unfavourable. The remainder of Wormskin No. 2 focuses on a particular part of the Dolmenwood, The High Wold, which lies to the south and west of Lake Longmere and the River Hameth (a nice touch is that the map of the region is reprinted in colour on the back cover of the fanzine). In particular the articles focus on the village of Lankshorn and the strangeness of the surrounding environs, such as Lankston Pool, where the only sign of the former village of Lankston is the village’s church pool sticking up out of the bog; King Pusskin’s Road upon which it is suggested that tribute be made to cats lest ill fortune fall upon you—cat scratches appearing on hands and arms, coughing up furballs, and so on; and a band of barrowbogeys prey upon travellers from the King’s Mounds. 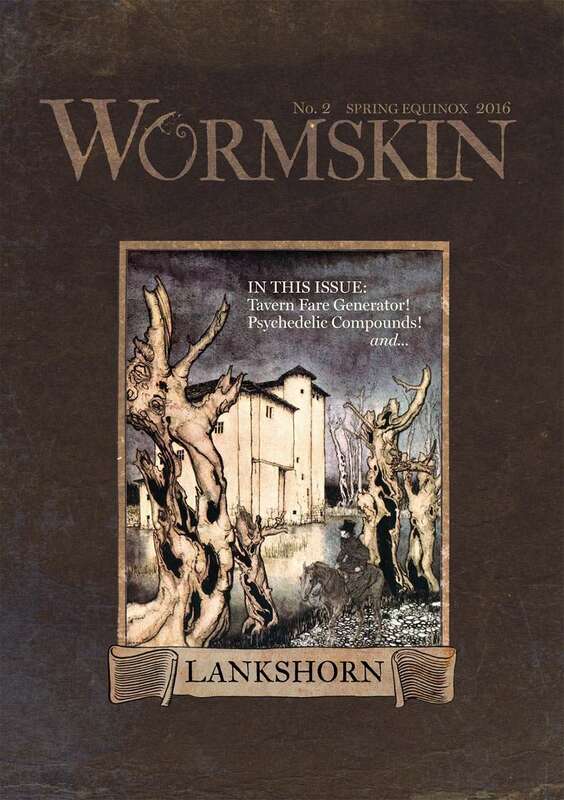 Notable places and peoples in Lankshorn include The Hornstoat’s Rest Inn, rife with rumour and innuendo, whose owner, Margerie Stallowmade is said to consort with fairies; The Man of Gold Apothecary, a ready source of the fungi and psychedelic compounds—as described in both this issue of Wormskin and the first—to be sourced from Dolmenwood; whilst not far out is the manse of Lord Malbleat, one of the goatlords of the region, renowned for his love of poetry and human brides, but rumoured to be a sorcerer and a sadist. Rounding out the description of the region is a bestiary of some of the monsters common to the region. They include Barrowbogeys or ‘plague fairies’ who carry jugs or pots as heads and curse others with plagues of boils and warts; Bog Zombies who jealously strangle their victims and drag them into the bog to rise as one of their number; and Woldish Goatman, who look down upon humans as an animal species whilst still breeding with them to produce Goatmen Thrall and sadistically flaying their skins to work into armour. It is said that to fall under the gaze of the Goatman is said to fall irrevocably under his charm. Accompanying each of these descriptions is a set of three tables, giving options for individual traits and potential lairs and encounters. These tables nicely extend the utility of the creatures whilst also providing the Dungeon Master with further ideas. Wormskin No. 2 is as ably presented as Wormskin No. 1. The layout is tidy and the writing not only clear, but also engaging. The artwork, a mix of publically sourced and original pieces is well chosen and enhances the dream-like menace that permeates the Dolmenwood. Perhaps the only thing that might be said to be missing from the issue is a scenario—there can be no doubt that it would be interesting to see a scenario set in the Dolmenwood—but until then, Wormskin No. 2 includes rumours aplenty that the Dungeon Master can develop into encounters and sessions as the player characters adventure in the region. This is in addition to the encounters and lairs given for the issue’s five monsters. Workskin No. 2 continues in the same vein and the same tone as Wormskin No. 1. It builds on the material given in that first issue even if to an extent—in the form of the article on psychedelics—it repeats itself. It develops the setting further by giving somewhere for the player characters to begin their exploration and adventures in Dolmenwood.